They had grown SIGNIFICANTLY since I had left. I’m so excited!!! My only fear is that they don’t have enough room to grow. 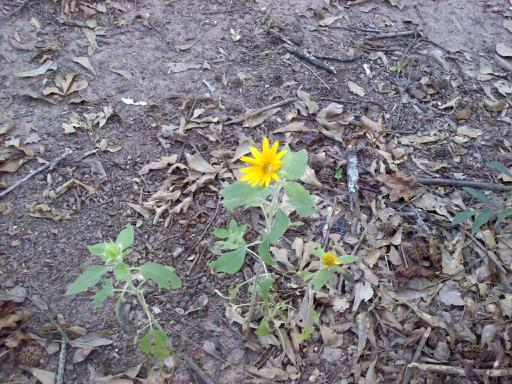 I’d re-plant them in our backyard, but we haven’t had a chance to clean it up and redo the soil and all that jazz. We just don’t have time. I also looked up whether or not I needed to give them a stake or wire or something for them to grow around, and I conclude from my research that they do not. Apparently there are some green beans that grow that way, and some that don’t. The ones I bought did not say I had to provide something for them to grow around, so…I will not provide it. 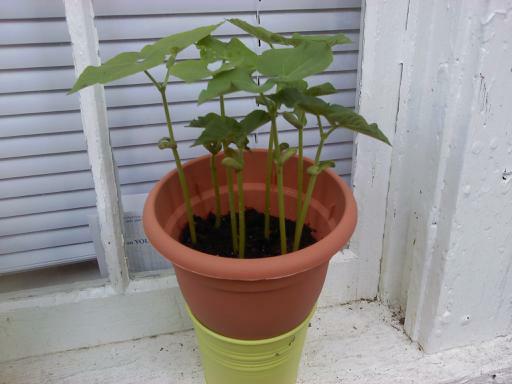 So I’m pretty psyched for these green beans to grow. Stay tuned! Last week there was a crazy storm in Atlanta, which took out my power for almost 3 days. I wanted to make this beef shabu shabu recipe, but in addition to the fact that I didn’t have all the right ingredients, I couldn’t really make it because I didn’t have internet. I could’ve written it down at work before I came home, but I forgot. I tried to make it from memory (I only read the recipe a couple times), but it just didn’t work. I’ll definitely try it again – hopefully the next time I go to the Buford Highway Farmer’s Market so I can get shabu shabu and thai basil. This week I’ve decided to try a Two Day Detox again, but this time with a vegetable-based juice. It’s called pH Solution: cucumber, celery, spinach, parsley, lemon, and distilled water. I’m still a bit skeptical, but so many people have been coming to Arden’s Garden asking about the TDD that I feel I should give it another try. Also, I made jook again this week since I had a bunch of leftover stuff from last week. That’s the downside of cooking for yourself: all the yummy meat and produce you buy will go bad if your electricity goes out. 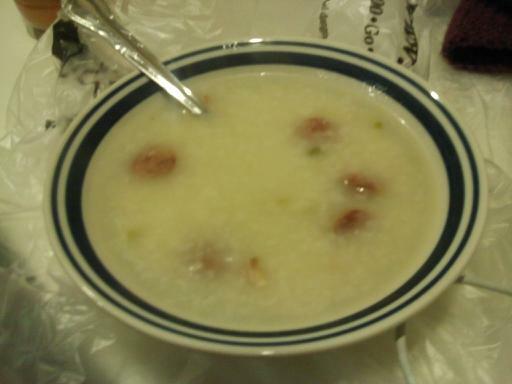 my jook! it looks like it's smiling at me (kind of retardedly)! so proud of myself. Let’s be honest: one of the main reasons Asian food tastes so delicious is because they add MSG to it. Another reason is probably because every restaurant has a family recipe or a certain way of making things. That’s how I feel about pho restaurants. Almost every place I’ve been to has had a unique broth, which can make all the difference. And those are the reasons why I didn’t enjoy my own pho. I bought a standard pho buillion, but of course it’s nothing like the restaurants. Sure, it smells the same for the most part, but there was just so much flavor missing from it all. 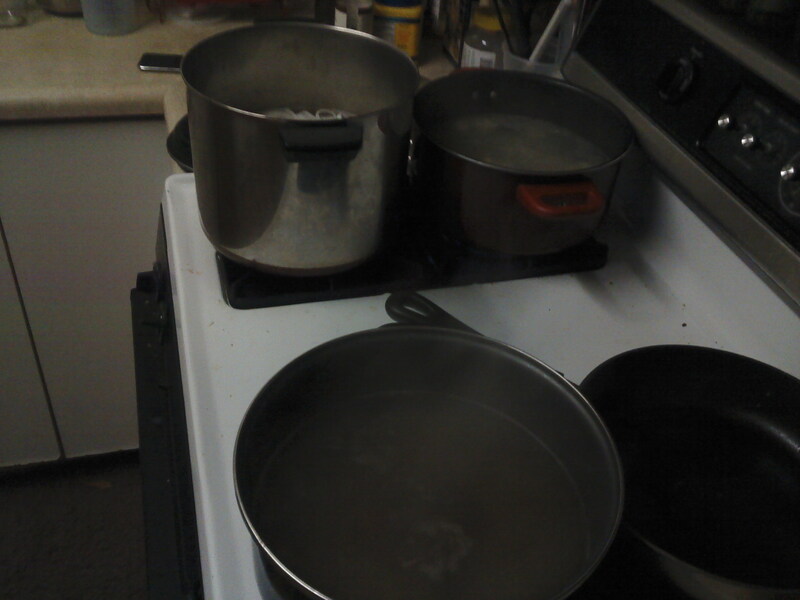 these are all my pots: tendon, noodles, and broth. insane. I’m not going to include my recipe because it will vary depending on the ingredients you use. (Plus, the noodles and the buillion came with directions.) The only thing that I really learned was how to cook soft tendon: boil it for 2 hours, then cut it up. Considering how soft and chewy and delicious it is in the soup, it takes a long time for it to get that soft (that’s what she said?). 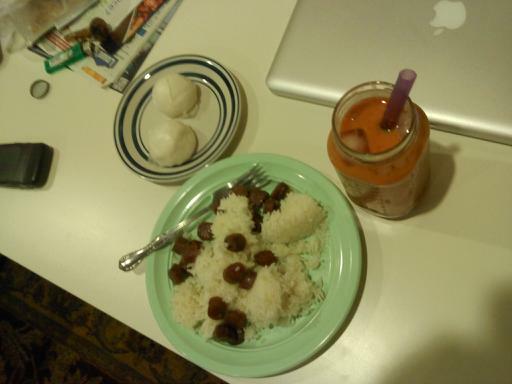 my lunar new year dinner: custard dumplings, rice and chinese sausage, and thai iced tea with pearls. YUUUUM! Anyway, instead I’ve decided to share with you the two almond cookie recipes I tried for the Chinese Lunar New Year. I’m also not going to post these recipes because they’re slightly different. Ultimately I’ve learned that, as much as I love Asian food and embrace my Chinese heritage, I will never be able to cook as well as my grandfather did. I wish I had a picture of him to share with you. He was such a big, happy man who was always so excited to cook for me. I have a fuzzy memory of being in his kitchen while he was cooking, and he showed me what he was doing. My dad tells me that, when he knew we were coming to visit, he would cook a ton of food and just wait for us to arrive. Whether or not he actually did, I can completely imagine it being true. I’d like to think that Grandpa watches me and cooks with me and is proud of me for eating and cooking all that I can. Pho #1 (Seriously) and Hi, Auntie Mei! First, I’d like to say hello to my Auntie Mei. She’s always telling me about the awesome food she’s cooking, and I’m excited to get her recipe for jook! Yummm. Anyway, last week I finally made it out to Buford Highway where there are tons of Asian restaurants and markets! It was really exciting. I almost peed myself when my boyfriend and I walked into Pho #1. 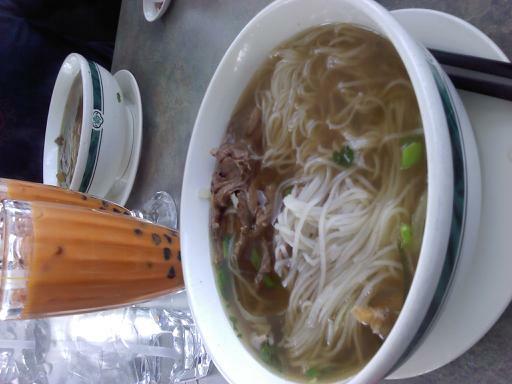 I ordered a large bowl of pho with flank steak, eye of round, and soft tendon, and a thai iced tea with tapioca pearls. It was heaven. I was only disappointed in two things. First, the bean sprouts were kind of sad-looking, but I’m guessing it’s not easy to find fresh bean sprouts in Atlanta. Second, I didn’t get as much tendon as I wanted, but that could be for any number of reasons. so so so so delicious. it's like a bowl of happiness with a side of awesome. After lunch we went to the Buford Highway Farmer’s Market. I’ve learned that farmer’s markets here are not the same as the ones in California. Why? Because they’re basically big grocery emporiums and not actually markets for local farmers to showcase their products. Regardless, it was an awesome time. And for next week, I bought pho buillion cubes, pho noodles, eye of round, and tendon. That’s right: I will attempt to make pho. Prepare yourself, ladies and gentlemen. chicken & rice. SE corner of 53rd and 6th. it's the same guys as on the SW corner. I also made a beer brined pork loin from Chili Cheese Fries for my manfriend when he came to visit. It was a-mazing. I’m always afraid of drying out pork, but this was juicy and perfect. I cooked it in the oven, but I definitely want to try grilling when it’s warmer! Tomorrow I’m going to make this recipe for Brunswick Stew, a traditional dish from Georgia (with German roots?). I also think that “Get a Husband” is a ridiculously silly title for it. I will definitely take a picture of it, but I can’t promise I’ll post about it this week. I’ll try!